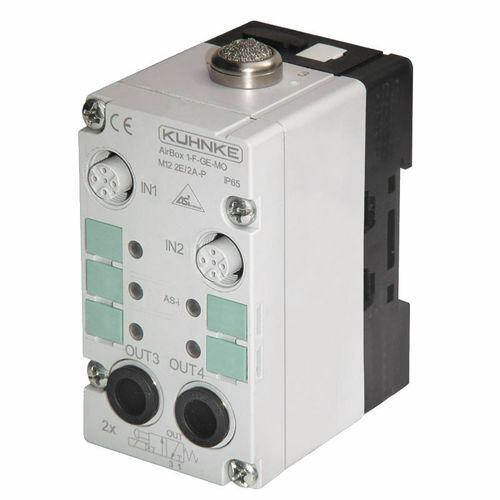 The pneumatic AS-Interface module AirBox 1 has 2 digital inputs and 2 pneumatical outputs. The input sockets can be wired up with sensors (PNP, via M12 plugs) in 2- or 3-wire connection. The sensors are supplied with energy from the pneumatic module. The outputs and the compressed air supply are connected to the module via a 8 mm plug-in tube connector. The recessed manual override can only be used with a tooling. Use outside diameter tubing only.